Diwali is the most important festival for all Hindus. Also known as the festival of lights, people light up their houses, shops and streets days and weeks in advance. It brings families and friends together to pray, feast, celebrate and relax – a little bit like Christmas in the West actually. People also see it as the beginning of a new year so people clean their houses, invest in new things and forget old problems to start fresh and clear minded into a new period. This article explains why, when and where Diwali festival is celebrated. If you want to experience the festival of lights in India plan your trip with us now. 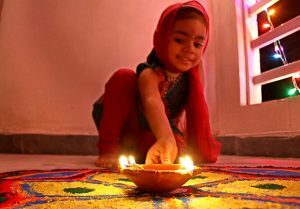 Why is the Diwali Festival celebrated? 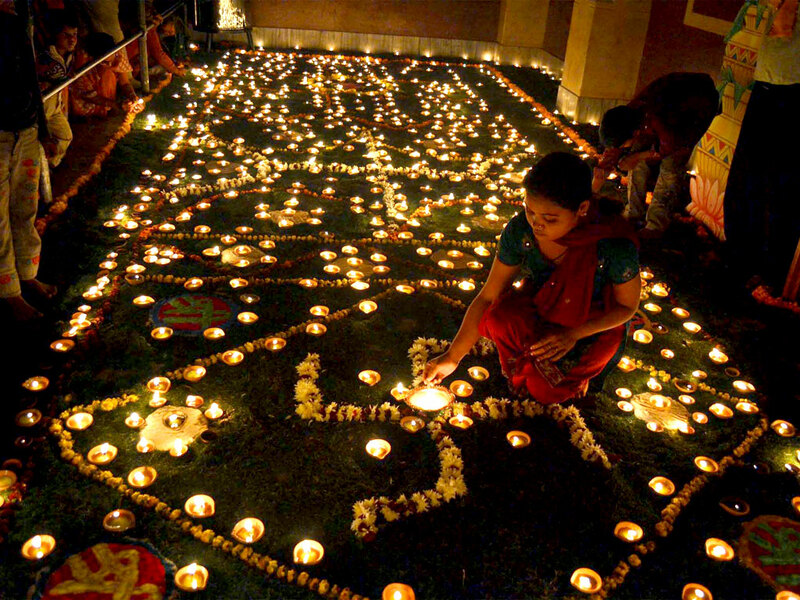 The Diwali festival marks the beginning of a new year in the Hindu calendar in India. It celebrates the return of Lord Ram from his fourteen years of exile in the forests after defeating the ten-headed King Ravana who had abducted his wife Sita. Hanuman (the monkey god) and Laxman (Ram’s younger brother) are other important characters in Ramayana, the ancient epic poem about Ram, Sita and righteousness. It is called the festival of lights because it symbolizes the victory of light over darkness, good over evil and hope over despair. 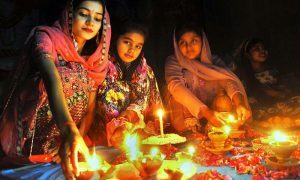 Hindus basically light up the night on this joyful celebration. Where and when is the Diwali Festival? The day of Diwali is the full moon in between the end of October and beginning of November. The celebrations are for five days with Diwali being the third and most important day. In 2017 Diwali will be on 19th of October, in 2018 on the 7th of November and in 2019 it will be the 27th of October. To find out what else to look forward to around this time of the year check out our blog articles on weather in October and November. 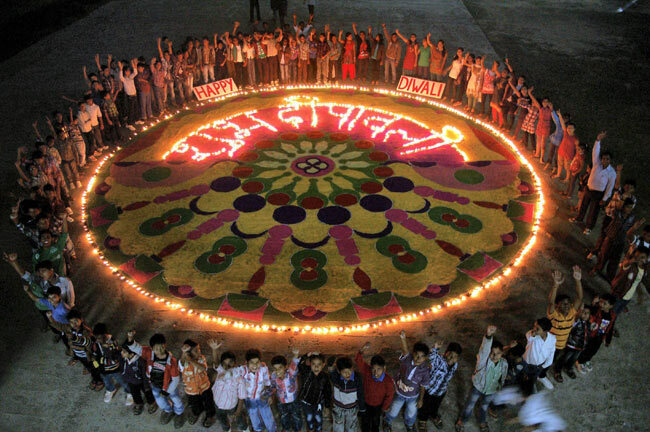 Diwali is celebrated by Hindus all over the country and in almost all states. You won’t find much Diwali spirit in Kerala though, where they celebrate Onam instead and have fewer Laxmi-worshipping merchants. Check out our route suggestions for north India to find out how to plan your trip around the festival. How is the Diwali Festival celebrated? The celebrations start on Day 1 with Dhanteras. On this auspicious day, Indians clean and decorate their houses and prepare for the festival. They also go out and buy new clothes – a great day for the Indian retail industry! The second day is also used for preparations but small pujas (rituals) are also celebrated on the first day of rituals. Rangolis, art patterns made of coloured powder and flours, adorn the front doors of people’s homes to welcome their guests for Diwali. 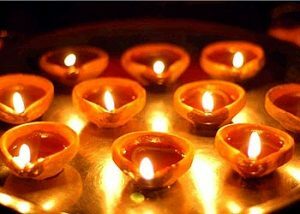 The third day is Diwali and the most important day where families and friends come together, exchange gifts and lit up diyas, small oil lamps that last for the whole night. Later at night, people go out onto the streets and light the fireworks and crackers to celebrate New Years Eve. The day after, New Year’s Day, relatives and good friends visit each other and exchange sweets and also gifts. The fifth day and last day is called ‘Bhai Dooj’ (the second day of the New Year, dedicated to brothers), this is when sisters cook for their brothers, put ‘teekas’ (red dots) on their foreheads and take their blessings and bond. A home stay in North India would be the ideal way to experience Diwali in India. You can go to Varanasi and watch the amazing aarti and let off fireworks by the Ganges River. Jaipur’s markets are completely lit up and an absolute visual delight during Diwali. Goa has a crazy Diwali gambling scene and a special tradition of burning effigies of the demon Narakasura. Amritsar, although essentially Sikh, is known for its Diwali celebrations, especially at the Golden Temple. It doesn’t necessarily matter where in North India you celebrate, just make sure to not travel on the day of Diwali and stay with a Hindu family and not at some big hotel to really experience the Diwali festival to the fullest. Diyas and firecrackers are everywhere, so be careful with your clothes catching fire (especially girls wearing ‘dupattas’ or Indian scarves). It’s also a good idea to wear ear plugs in India during the Diwali festival, especially if your ears are sensitive. Some crackers are extremely loud, and sound more like explosions. The noise can be very damaging to your hearing. There’s also a lot of smoke in the air which may make it hard and difficult to breathe. Don’t keep your face too close while lighting fireworks and make a run for it once you light them. Children must be supervised! We hope you all have a safe and happy Diwali! If you’re travelling to India during the Diwali season, make sure you book well in advance – train tickets, hotel bookings, guides, becomes harder and more expensive to book. Accommodations in major tourist destinations are often booked out months in advance. But the most difficult thing are train tickets as people all over India travel to see their loved ones. Don’t know how to incorporate the Diwali festival into your India travel plans? Afraid it’s too late to plan for Diwali? We’ll make it possible, don’t worry. Plan your trip with us now! 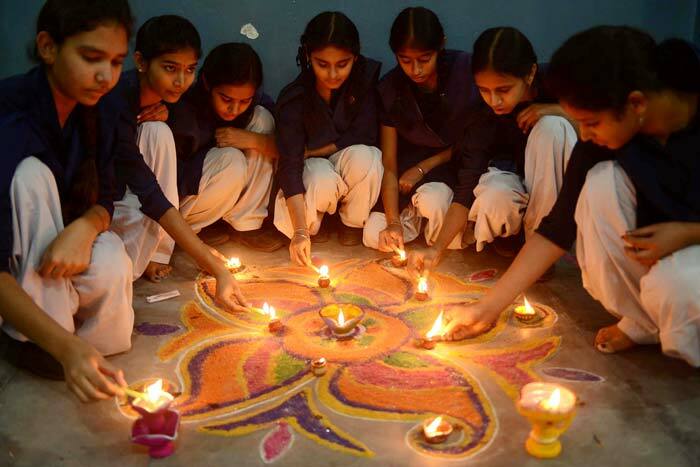 Diwali is the festival of lights, the biggest holiday for Hindus.